Great advice! Thanks for the helpful tips. Last week I talked about the rules of dialogue based on some issues I’ve seen in self-published works recently. Following the rules makes it easier for readers to follow along with conversations between characters. Today I want to talk about an equally important topic of creating conversations that sound realistic. Writing dialogue is different than writing narration, and it also changes depending on if you’re writing in first or third person. It comes down to remembering that in your writing you will have different voices, just like people have different voices. The narrator has one voice and each of the characters have their own voices. This may sound complicated but it comes down to our good friend characterization. You’re absolutely right! It’s easy to slip into passive voice without thinking about it. From time to time I’ll use Hemingway App to help point out the errors. There are many things that we often unconsciously do when we are writing. 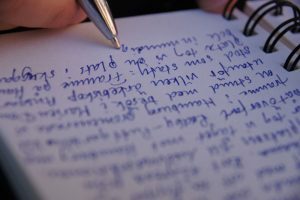 The more that we write, the more that we get to practice and hone our skills. Writing more also helps us to spot those regular patterns in our writing that could probably do with a bit of ironing out. One of the things I often notice about my own writing is that I often begin sentences in the same way, or with the same words, and so I try to vary them as much as possible. When this happens, I have to consider whether I am using the active or passive voice. The theme on this blog for July is language. So far, we have thought about writing speech and whether to use the first, second or third person in our writing. Today, I want to look at active and passive voice. This is a the most thorough post I’ve seen in a long time. Great examples! Thank you for sharing. When I did research about book agents, I also did research on book proposals and what the agents look for. The focus of this blog post is chapter summaries. One may forget to write one paragraph summary for each chapter because one may focus too much on characters, plot, flow, and English (or whatever language you write in). It is easy to forget about chapter summaries. However, if you have not done chapter summaries for your novels yet, start doing them now. Great list! I’ve heard of Goodreads and TED Talks, but not the others. I will definitely check them out. Thanks for the tip.